These were painted in August last year, which not only marked my godson William's 1st birthday but also the end of an era as I left my house of three years and moved on to pastures new. 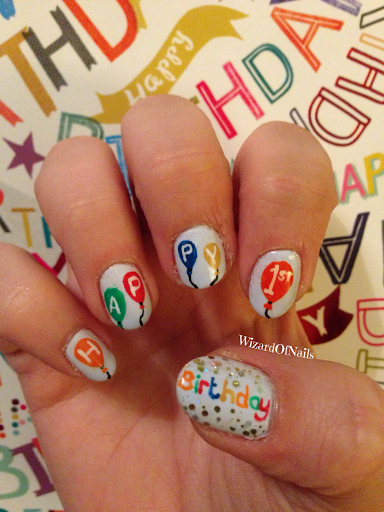 On my left hand are the birthday nails with Happy 1st Birthday written across them in balloons with added glitter using Barry M Yellow Topaz Glitter. On my right hand are Disney kings and queens nails to match our leaving party theme as we lived on Kings Grove in Queens Road Peckham. 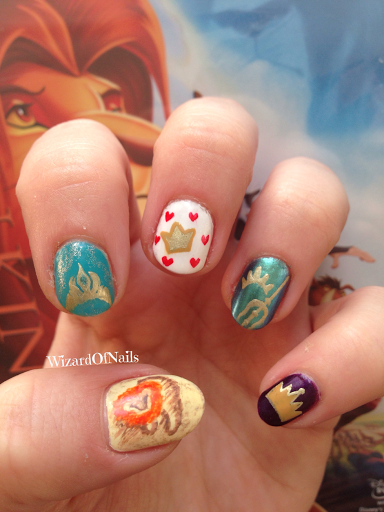 From left to right I have Simba from the Lion King, Elsa's crown from Frozen, the Queen of Hearts crown from Alice in Wonderland, King Triton's crown and trident from the Little Mermaid and the evil queen's crown from Snow White.